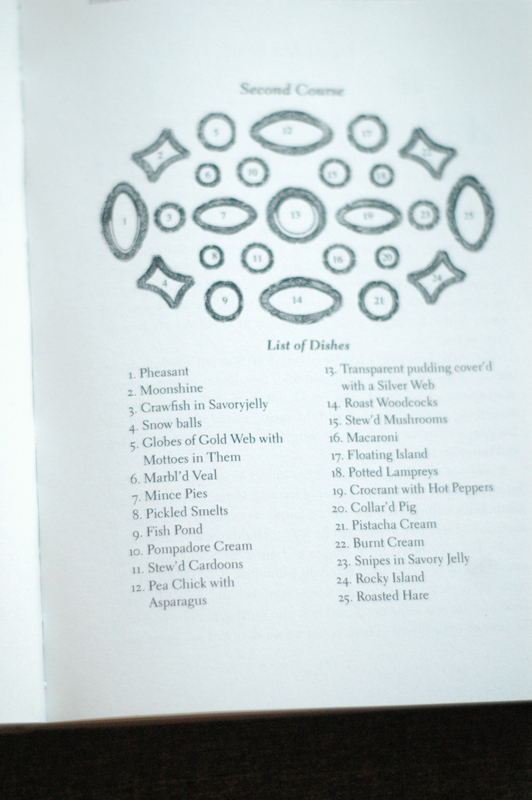 A long while ago I wrote a series on Victorian cooking (here, here, here, and here). Many people asked about specific Victorian recipes or dishes, either for a Victorian dinner-party or to bring a fun snack to school for presentations and such. In the nineteenth century, cooking wasn’t really a hobby, it was either a necessity or just something you hired a cook for. Furthermore, there were no real recipe books, though at the end of the century some books with suggestions came into fashion, mostly in America. It wasn’t very commom for novels to explain what food was eaten, and food wasn’t really a topic of discussion as it is now. Therefore, it’s pretty hard to find actual recipes or dishes from the nineteenth century. I finally found a very good resource in the Annotated Emma by David M. Shapard ( who got them from E. Raffald, The Experienced English Housekeeper). I will repost them here. This dish consists of: Transparent soup (some sort of broth? ), Fricas’d chicken, Harrico (green beans), Pigeons Comport, Codsounds like little Turkies, Lambs Ears Forc’d, Fricando Veal, Pork Griskins, French Pye, Brocoli &c., Kidney Beans, Small Ham, Mock Turtle, Boil’d Turkey, Sallad, Bottl’d Peas, Sweet Breads Ala Royal, House Lamb, Sheep Rumps & Kidneys in Rice, Ox Pallets, Larded Oysters, Ducks Alamode, Beef Olives, Florendine of Rabbits, Hare Soup. This second course consists of: Pheasant, Moonshine, Crawfish in Savoryjelly (sic), Snow balls, Globes of Gold Web with Mottoes in Them, Marbl’d Veal, Mince Pies, Pickled Smelts, Fish Pond, Pompadore Cream, Stew’d Cardoons, Pea Chick with Asparagus, Transparent pudding cover’d with a Silver Web, Roast Woodcocks, Stew’d Mushroomd, Macaroni, Floating Island, Potted Lampreys, Crocrant with Hot Peppers, Collar’d Pig, Pistacha Cream (pistachio something? ), Burnt Cream (maybe a creme brulée? ), Snipes in Savory Jelly, Rocky Island, Roasted Hare. Wel… are you hungry? They definitely knew how to eat, then! Some of these dishes are fairly straightforward but some of them are very puzzling. If you know what they mean or feel like googling for them, please let us know what you found in the comments! I’m especially curious about “Globes of Gold Web with Mottoes in Them”. 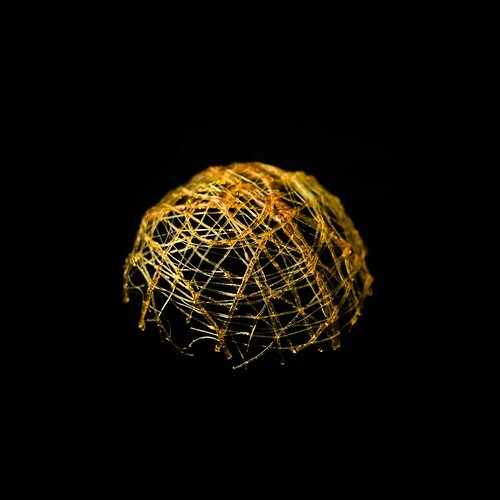 Maybe the Globes of Gold Web are something like this? Ludivine: that does look really amazing! Who knows, it might be. But the mottoes in them…? An interesting article. I am a volunteer Room Steward for English Heritage at Brodsworth Hall and Gardens, South Yorkshire, England, and the Thellusson family was absolutely fascinated by desserts as seen by the collection of moulds, which helped to make dinners more exciting and served as a talking-point when they had guests to dinner. Reblogged this on Shelly Miller Diary. Transparent soup—presumably a clear soup, broth or consommé. Harrico—presumably haricots verts, i.e. green beans. Pigeons comport—could refer to pigeon in port wine sauce. Codsounds—Cod’s sounds, the air sac or swim bladder of the fish; can be prepared in many ways. Fricado Veal—veal stewed with mushrooms and flavored with almond, garlic and saffron. French Pie—this could be anything, perhaps a tourtiere. Sweetbreads a la royale—In case you don’t know, “sweetbreads” is the generic term for various glands left over after butchering the animal, such as the thymus, pancreas, parotid gland, sublingual gland, etc. In other words, awful offal. “A la royal” means to stew with a LOT of shallots and garlic. Florentine of Rabbit—Take a whole (head and ears intact) skinned and boned rabbit, stuff the body cavity with a forcemeat made of bread, rabbit liver, bacon, anchovy, wine and herbs, then stew it. When done, cover the rabbit with a veal stock white sauce, thickened, flavored with anchovy, lemon, eggs, cream and nutmeg. Snowballs—probably the same as today; sugar coated nut and butter cookies. Fish pond—unclear; perhaps some form of tidbits in aspic. Marble veal—prepare pureed seasoned veal and pureed mix of tongue and lard; pack into a mold in alternating layers, douse with clarified butter, press until compacted, then unmold and slice. Stewed cardoons—cardoon is a thistle, closely related to the artichoke. Pompadore cream—crème pompadour; flavored whipped cream colored with three or more contrasting colors, then layered color by color in a bowl. Transparent pudding, etc.—basically, a custard pie. Pea chick with asparagus—I doubt if this means chickpeas. A pea chick is a young pea fowl and pea fowl were considered a delicacy as early as the 16th. Century. Floating island—meringues floating in crème anglaise , or vanilla custard. Burnt cream—could be crème brulee. Hiya by the middle of the century there were very good cook and household management books available . The “Martha Stewart of the time was Mrs Beeton. I have an original coIpy of her book. It is filled with recipes for everything you can imagine. I have a link on my blog that gives a long list of cookbooks for each 20 years of English history (for example 1800-1819 cookbooks) [see link below]. Some of those cookbooks weren’t just food prep recipes, but recipes for making cleaning supplies, boot black, black for stoves, illness remedies, and some even quote Sir Humphrey Davy’s Elements of Agricultural Chemistry of 1815 or so, in an attempt to help those tending large kitchen gardens improve their soils with mineral manures. I’ve also listed a few of the cookbooks on my blog as well! June 20, 2012 at 2:30 pmI by no means justify this attack. especially if you read what I wrote on the post. That I mention the many aspects of the illegal immigration problem does not mean I support the attack. this is uneebilvable. Butter, sugar…..what’s not to like? The recipe said to separate three eggs, so I put one in the kitchen, one in the dining room and one in the parlor. Now what do I do? 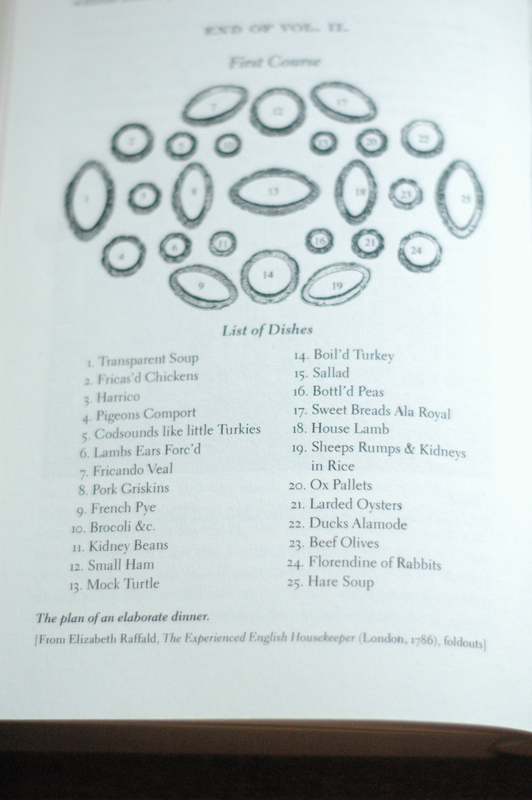 There were cookbooks in 19th century Britain, Mrs. Beeton, for one. Hi Geerte, I came across your blog when I was doing some research on 21 course royal menus ( I have a project nearly finished for a new set of cooking dictionaries in 9 languages with 26 sections ( just to boast a bit the cooking terms section has nearly 13,000 entries and Kitchen utensils more than 5000 (every dish, knife fork, glass cup, pot, pan etc) LOL, 8 years of work so far. Anyway back to your menus (by the way you need to change your heading to menu or meal (not course). I list below some suggestions for your uncertainties (creme brulée etc). I also include another menu for interest. A meal is a series of courses of food that are served in a pre-determined order. In the past it was possible to have up to 25 courses (some Thai restaurants still have up to 15 courses on the menu). Normally there are four main meals in a day, breakfast, lunch (dinner), tea (Dinner), Supper. The meals served depend on a countries local customs. Other supplementary meals may be served in between the main meals ( elevenses, snacks etc.). omelette Espagnole, Oeuf en Cocotte a la crime, Oeuf poche florentine. Some examples include Spaghetti Bolognaise, Lasagne Napolitaine and Macaroni au gratin. Sole, Salmon, Halibut, Escallops, Poached Salmon with Mousseline Sauce, etc. Rarely seen on a menu for the evening meal are: Cod, Bass, Haddock, Brill, Hake, and Plaice. The following items, with their appropriate garnishes and sauces, can be successfully served as entrées. Cauliflower Mornay, Baked potato and Grilled tomatoes. Apple pie, Chocolate souffle and Cassata ice-cream. Cheese is usually served with butter, crackers, grapes, apple and occasionally celery. Gouda, Camembert and Cheddar are some examples of cheese. All types of hot or cold beverage,Tea,Coffee etc. are served. This menu consists of: 1. Transparent soup (some sort of consommé), 2. Fricaseed chicken (chicken Fricasée), 3. Harricots (green beans), 4. Pigeon en Compot, 5. Cod sounds broiled with gravy, 6. Stuffed Lambs Ears, 7. veal fricandeau, 8. Pork Griskins, 9. French Pye, 10. Brocoli &cream, 11. Kidney Beans, 12. Small Ham, 13. Mock Turtle soup, 14. Boiled Turkey, 15, Sallad, 16. Bottled Peas, 17. Sweet Breads à la Royal, 18. House Lamb, 19. Sheep Rumps & Kidneys in Rice, 20. Ox Palets, 21. Larded Oysters, 22. Ducks à la mode, 23. Beef Olives, 24. Florentine of Rabbit,25. Hare Soup. This second menu consists of: 1. Pheasant, 2. Moonshine, 3. Crawfish in Savory jelly (sic), 4. Snow balls, 5. Globes of Gold Web with Mottoes in Them, 6. Marbled Veal, 7. Mince Pies, 8. Pickled Smelts, 9. Fish Pond, 10. Pompadore Cream, 11.Stewed Cardoons, 12. Pea chick with Asparagus, 13. Transparent pudding covered with a Silver Web, 14. Roast Woodcocks, 15. Stewed Mushrooms, 16. Macaroni, 17. Floating Island, 18. Potted Lampreys, 19. Crocant with Hot Peppers, 20. Collared Pig, 21. Pistacho Cream, 22. Burnt Cream (creme brulée? ), 23. Snipes in Savoury Jelly, 24. Rocky Island, 25. Roasted Hare. Pork Griskins are a pork chop with the skin and bone removed allowing the butcher to cut thinner steaks (ideal for the smaller appetite), whereas the pork chop can only be cut between the bone. House lamb is lamb prepared in the way of the chef of a large country house etc. Sheeps rumps (chump) are a large piece of roasted boneless lamb (roasted in an ovenproof dish) served with lambs kidneys and shallot purée. Ox Palate is the roof of a cow’s mouth. … Larousse cites a 1769 French recipe for “Allumettes de Palais de Boeuf”, thin strips of palate which are battered then fried. To fricando Ox Palates (The experienced english housekeeper By Elizabeth Raffald). Beef olives: Nothing to do with the olives that grow on trees these form the base of a braised meat dish popular in Scotland since the 1600’s. They are thin beef steaks, wrapped around a filling of stuffing or sausage meat. pistachio butter is ground pistachios and maybe some salt. pistachio paste is ground pistachios, sugar, and sometimes a little food coloring or flavoring. pistachio cream is ground pistachios, sugar and cream. Crème brûlée also known as burnt cream, crema catalana, or Trinity cream is a dessert consisting of a rich custard base topped with a contrasting layer of hard caramel. Also Francatelli’s Cookery Book (c1860s) another: Modern Cookery, For Private Families, by Eliza Acton, 1860 … Thanks to all who send old recipes, I love reading them. Putting some in my Victorian cookbook which is due out sometime early 2018. Again, thank you. cardoons are a vegetable, they look quite similar to artichokes. Glad the other person posted the “golden globe”, which probably looked just like that — hollow ball of spun sugar syrup which would look golden when heated and caramelized a bit. The motto sounds like today’s fortune cookie — inside the golden sugar ball, they would put a folded piece of paper with some “words to live by” written on it. They should revive this dessert, it sounds lovely and fun. More enjoyable than fortune cookies anyway.